At the end of the Second World War, the whole of Germany was divided into Soviet, US, French and British zones of occupation, and the city of Berlin, deep within the Soviet zone, was likewise divided into four. In 1949, the three Western Allies’ zones of Germany became West Germany (Federal Republic of Germany), with its capital at Bonn, and the Soviet zone became East Germany (German Democratic Republic), with its capital at East Berlin, the former Soviet zone of Berlin. The three Western military governors were replaced by civilian high commissioners in 1949, and they in turn became ambassadors when occupation officially ended in 1955. The three zones of Berlin occupied by the Western Allies were combined in 1949 to become West Berlin: it was associated with West Germany but was not part of it. The Berlin Wall, dividing East and West Berlin, was erected by the East Germans in 1961. In Bonn, the first British high commissioners had their offices in Wahnerheide, an ex-Luftwaffe base and airfield, sixteen kilometres to the north-east. This was too far out for efficient administration. The Americans and French had decided to move to Bad Godesberg, a smart district on the west bank of the Rhine in south Bonn. The British mission needed to be out of its camp before the occupation of Germany was to end in 1955. A freehold site of about 9,000 sqm on which to build new offices at 77 Friedrich Ebert Allee was therefore bought in 1952 from Frau Gertrud Linden for £11,500. The offices were to be quickly built and austere, both because their cost was to be met by the British government and not by the Occupation Costs Budget and perhaps because the Federal Government asked that the building should be affordable for occupation by the commercial sector, who at that time expected lower standards, if the diplomats were to move back to a re-established capital at Berlin. The new offices, with RP Mills as the Ministry of Works as architect in charge, turned out correspondingly mundane in plan and appearance. The local associate architect was Herr Walter Colombo, and the contractors were Wilhelm Dueker and Ludwig Weiser. It comprised three storeys and a basement of an elongated L-shape building, each floor with a spine corridor with cellular offices on both sides, and a large free-standing canteen hall beside. A potential extension was site planned that would turn the L into a U. The building was completed in late 1953 for approaching £150,000, and was too small from the outset. The pre-planned extension was put in hand almost immediately: it, and the corresponding enlargement of the canteen hall, was completed in 1955 at a cost of about £75,000. Even so, the new offices had become seriously overcrowded by the mid-1960s and a further extension to them was mooted. Some believed, however, that there was good reason to look more radically at the embassy’s future requirements now that the Berlin Wall made a longer, if not permanent, stay in Bonn more probable. By 1969, four possible sites were identified on which to build new offices, and possibly a new residence: they were adjacent to the present office site on Friedrich Ebert Allee, on Buchelstrasse in Bad Godesburg, and on the sites on the Rhine immediately to the north and south of the residence (Deichman and Van Gülpen sites respectively. Preference for the Van Gülpen site gradually emerged. Norman Isham, a senior architect in the Property Services Agency, produced a careful and workable design for new offices on the site and presented it to the city authorities in early 1971 in order to obtain their approval in principle before finalising purchase of the site. He was successful and plot numbers 929/90 and 1037 on Rhinestrasse, comprising about 1.5 hectares, were therefore bought in March 1971 for £427,000. The idea of replacing the residence in the same scheme, perhaps as a penthouse flat with a dedicated garden area, gradually fell away despite, or perhaps because of, considerable efforts by visiting Property Services Agency architects from London to discredit the present residence. Powell and Moya, architects, were commissioned in 1972 to take the outline scheme forward and Philip Powell himself spent a good deal of time on the project over the next eighteen months. But to no avail: it was all too much time, trouble and cost in comparison with adding yet another wing to the office block on Friedrich Ebert Allee (which, in the event, never happened either). The Van Gülpen site was sold in 1977. The first high commissioners lived in the requisitioned Schloss Rőttgen, a large and isolated palace about thirty kilometres from Bonn. Its owner was entitled to its repossession in 1953 and a search was accordingly started in 1952 for an alternative residence to lease. Nothing particularly suitable was found, not least because Bonn was no more than a town at the time. Sir Ivone Kirkpatrick, the high commissioner, then learned that the requisitioned house on the Rhine at 39 Heisterbachstrasse, Bad Godesburg, occupied until recently by the American high commissioner, General McCloy, might be leasable once its owner, Frau Gertrud Strunck, regained possession. She decided, however, to sell rather than lease but was prepared to give the British government first refusal. The choice was fairly stark: either to buy her house for about £35,000 for immediate occupation or to build a new residence in the Bonn area that would cost more and take longer. Nor was there much room for negotiation because other missions were still hunting for residences and commercial interests were in the chase as well. Given that the house was on the small side for a major residence, the Ministry of Works was keen to get the Foreign Office to make a long term commitment to it: they succeeded in eliciting the view that it would be unreasonable to seek to replace it within ten years. The Treasury approved purchase at £30,000 plus £10,000 for ingoing works, and the deal was completed on 3 December 1952. The house was de-requisitioned on the same day. The house, also called Rheinschlussen and Villa Ackermann after a previous owner, was built in 1904 for Fraulein Johanna Cappel. Its architect was Heinrich Plange of Wuppertal-Elberfeld and he produced a pleasing Jugendstil composition. Fraulein Cappel drowned in the Rhine in 1920 and the house passed through several ownerships before being bought in 1941 by Herr Strunck. It was requisitioned in 1945 and used by the American Forces as a transit camp before being renovated as the residence for General McCloy. The Ministry of Works re-arranged the bedrooms on the upper floors before the British high commissioner moved in. The house was always slightly too small: it had no usable garden area so, for many years, part of the adjacent site to the north that belonged to the Diechman family was used for overflow space for large occasions. A detached teahouse was demolished in 1960 and a new dining room constructed, with access to the oval sitting room. The kitchen and staff quarters were extended in 1973 and the small Aubusson drawing room was converted into a library in 1978. The front courtyard was redesigned in 1979 for the installation of the fine stone Sundial by Ian Hamilton Finlay. The United Kingdom established diplomatic relations with the German Democratic Republic in 1973 and a British Embassy was established in the spring of that year. For offices, an unexciting six-storey terraced block at 32-34 Unter den Linden was leased on quarterly terms from March 1973. For residence, a property of about one hectare at 6-8 Mittelstrasse was leased in the good (relatively speaking) residential area of Niederschonhausen . The early twentieth century house on it was extensively renovated by the East Germans in accordance (more or less) with specifications provided by London. The initial lease was for eight years from November 1973, thereafter quarterly. 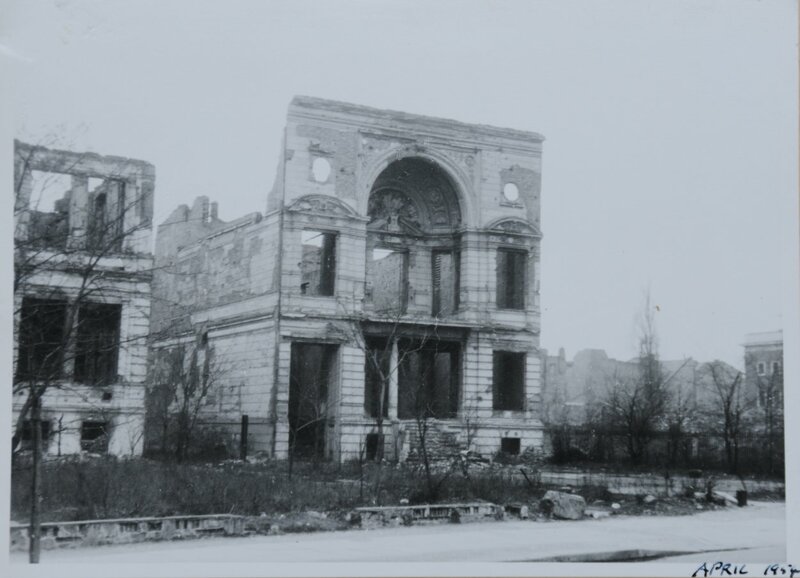 What remained of the Palais Strousberg after it was bombed in 1943 was demolished in 1951 and the site on Wilhelmstrasse (re-named Otto-Grotewohlstrasse in 1964, after a recently-deceased GDR minister) was used as a carpark for East German officials and, after 1961, lay untouched in the cordon sanitaire on the East side of the Berlin Wall. 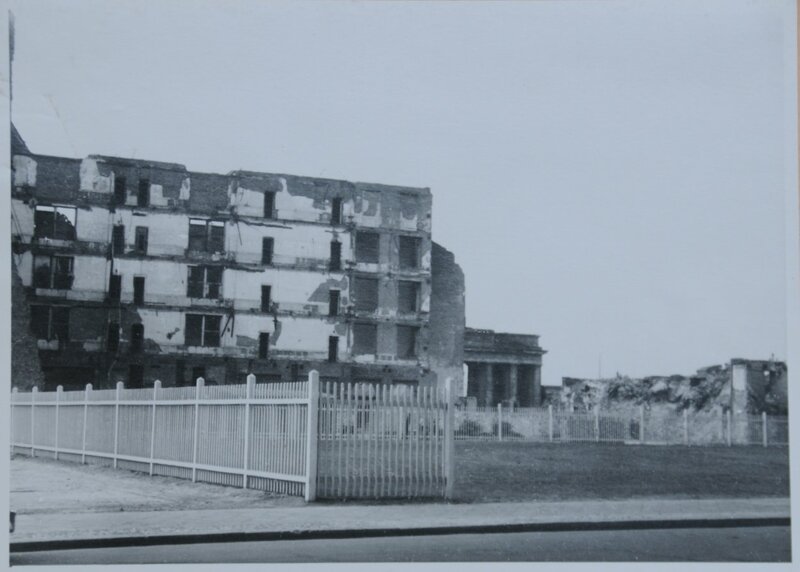 The consulate site at 17 Tiergarten, in West Berlin, was likewise eventually cleared of rubble in the mid-1950s. 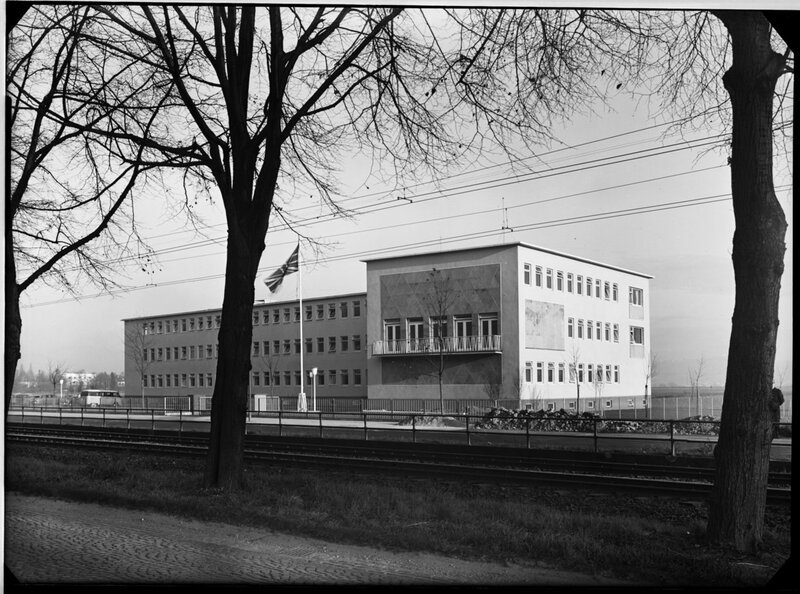 In 1958, the Foreign Office tried to persuade the Ministry of Works to acquire three plots of land adjacent to the consulate site on which to build embassy offices if and when a British embassy came to be re-established in West Berlin in the future. The Ministry would go no further than agreeing in principle to secure cost-free options on the sites: the idea fizzled out and the site was disposed of to the authorities for about £200,000 in the early 1980s. 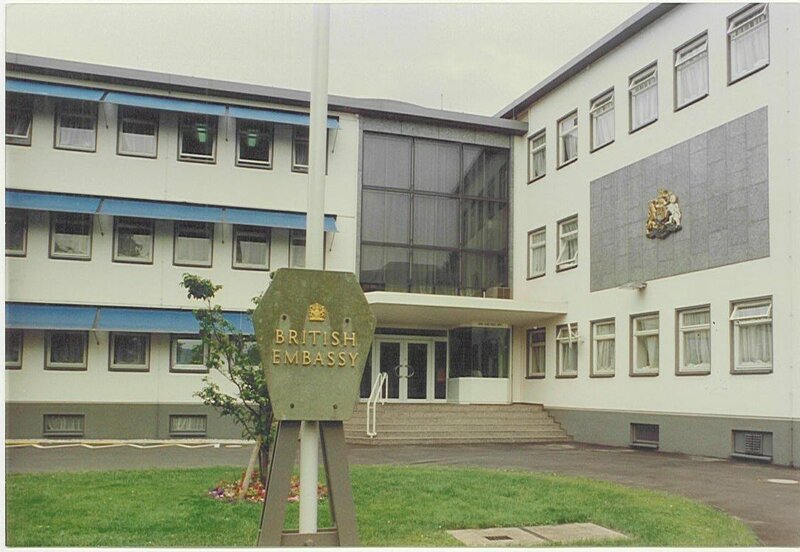 The United Kingdom maintained three offices in Berlin throughout the period that the embassy was in Bonn: the political adviser to the British Military Government had offices in London Block at the Olympic Stadium and lived at 13 Taubertstrasse; the consulate-general was in leased premises at 7/8 Uhlandstrasse; and the commercial offices were leased in the International Trade Centre Administration Building at 35 Georgenstrasse. In addition, the Berlin Senat bought the large house at 10 Hohmannstrasse in 1957 so that the British ambassador at Bonn, who was also high commissioner of the British Sector of Berlin under the Four Power arrangements for the city, had somewhere to reside during his visits to Berlin. Louis Ullstein, a newspaper owner, had bought the site in the Grunwald, in1929 and built the house in the following year. His widow sold the property in 1934 for 300,000 Reichsmarks to another widow, Frau Geheimrat Hildegard Henschel. Towards the end of the Second World War the house was bombed and most of the contents stolen. In the early 1950s, the Ullstein family filed a restitution claim to the effect that the 1934 price paid for the house was unfair, and was awarded further compensation of DM 18,000. That deal paved the way for the purchase of the house by the Senat. 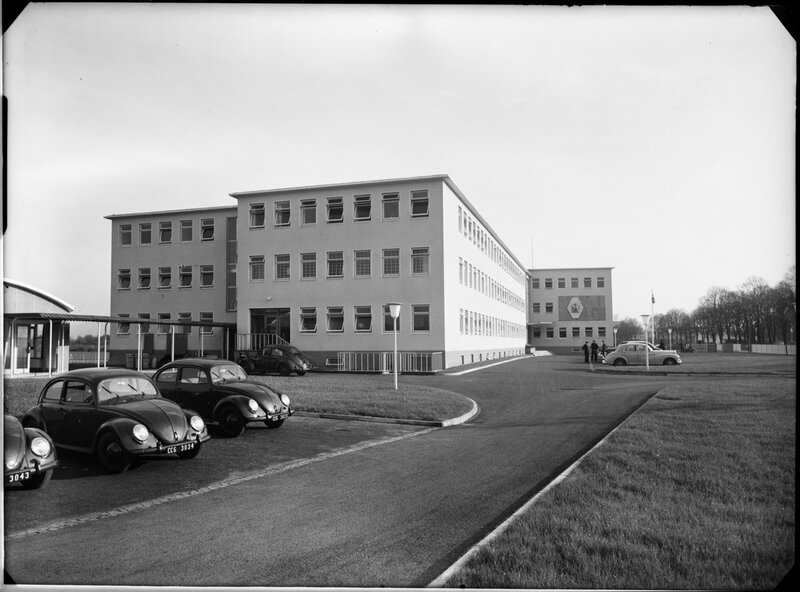 Bonn offices, 1953. Free-standing canteen building is to the left. Entrance to Bonn offices, 1990s. 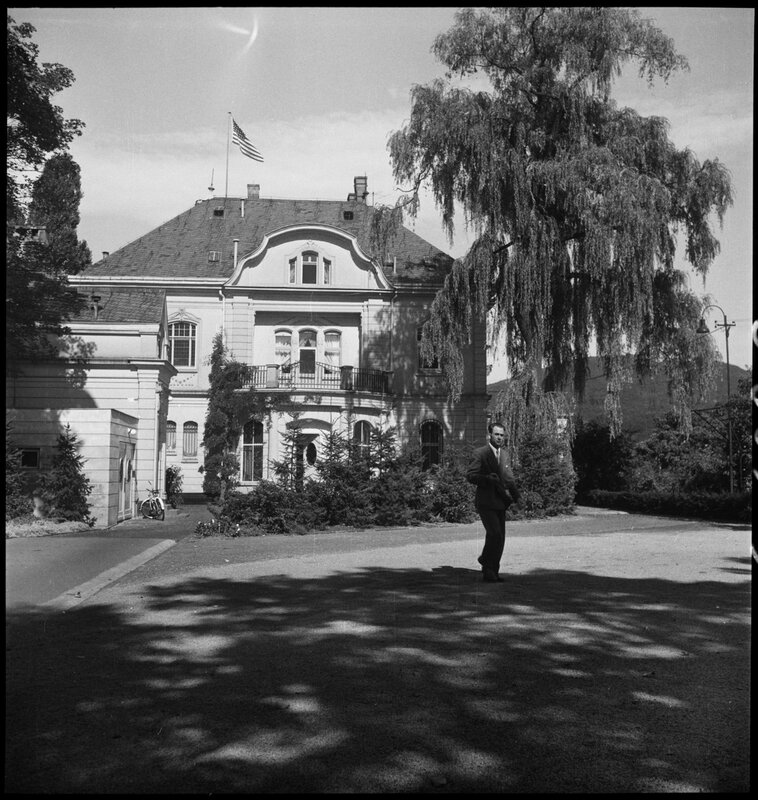 Ambassador’s residence, Bonn, at 39 Heisterbachstrasse, 1952 (just before its vacation by the American high commssioner). Site of former Palais Strousberg, with damaged Brandenburg Gate beyond, 1950s. Remains of consulate building at 17 Tiergartenstrasse, 1954.